When the weather is cold and you need something to warm you up, soup is the perfect lunch or dinner meal. We think a cold-weather soup is even better when it includes a bit of spicy heat as well. 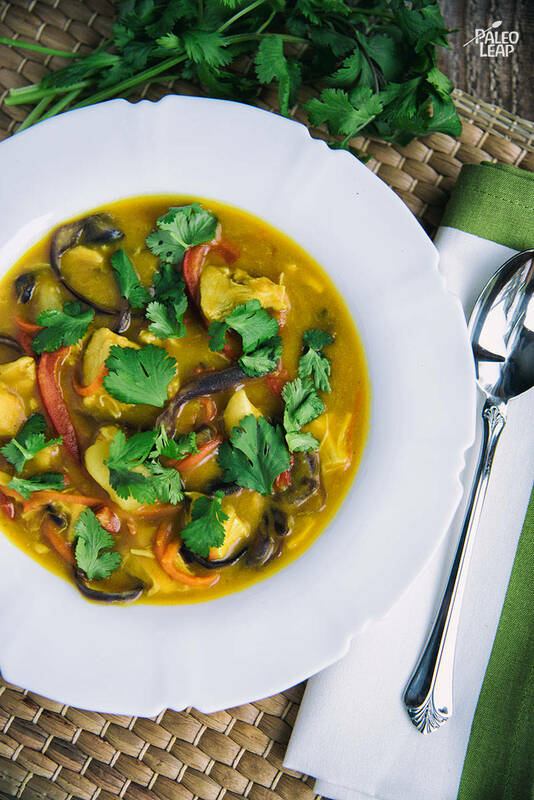 That’s why we love this coconut curry chicken soup recipe – this Paleo version omits some of the things you might see in a typical recipe (like flour or other unnecessary additives) while still giving you a tasty, quick meal. Although the ingredient list here might seem a little complicated, this soup comes together fairly quickly. Make note that this recipe calls for cooked chicken – we love the idea of using leftover chicken from an earlier meal versus making it separately for this dish. If you’re really looking to save time, consider throwing the ingredients for this in a slow cooker and set on low for 6 to 8 hours – you’ll take some stress out of your evening and come home to a nearly-made meal that just needs a spin with the immersion blender. When non-Paleo eaters eat soup, typically it’s paired with a bread and salad. One of these doesn’t work so well for Paleo eaters, so let’s look at some other pairing options! A fun but time-intensive idea is pairing this dish with a batch of cauliflower tortillas – make them a bit thicker to serve “naan”-style. Or, just stick with a nice salad – for this dish, we like the simple fall vegetable salad topped with olive oil infused with some of the curry paste from this dish. Melt some cooking fat in a large pot over medium heat and cook the onion, garlic, and ginger for a few minutes. Add the curry paste, turmeric, salt, and pepper and continue to cook for another minute or two. Add the coconut milk, broth, and potatoes and simmer until the potatoes are soft. Blend the mixture into a smooth puree using an immersion blender, adding more broth as needed if the soup is too thick. Melt some cooking fat in a skillet over medium-high heat and heat the chicken, bell pepper, carrot and cabbage 2 to 3 minutes. Mix the chicken and vegetables mixture into the soup and serve with fresh cilantro.